Hello everyone. What a hectic couple of weeks it's been for me. My new cushion is doing very well and I've had a few orders for it. I'm always nervous about selling my work. I hope that people will like it as much in the flesh as they do in the photos. It's always tricky with handmade too. Where do you draw the line when it comes to something that looks handmade and something that looks professional? I'm always being told when I print something that it doesn't have to look perfect. Sometimes, with block printing, there can be slight imperfections. These imperfections can give character to the cushion or bag. And I like that. It doesn't mean that I accept something that is smudged or just looks bad. Also, here I am on the Poppytalk blog! So, I have a confession. I have not got round to printing most of my orders yet. A day after I listed my new cushion on Etsy, I realised something was wrong with me. I'd been feeling ill for a few days with what felt like a nasty tummy bug. After 3 days, it didn't go away and I joked with my husband Ben that maybe I was pregnant, seeing that it was quite similar to how I felt when I was pregnant with our daughter Jill. He laughed. We have been so exhausted eversince having Jill two and a half years ago and also with trying to have lives of our own, you wouldn't believe we had time for any jiggy stuff. So, we bought a test kit and it came out positive. After me shedding a few tears (well, lots of tears really) and feeling like it could not come at a worse timing than this (we're moving house in 2 weeks and I have just found myself a cool studio space! ), we decided, it's probably a really good thing, even though I am feeling totally rubbish and sick at the moment. So, to all those who have placed orders, please do not panic! I am working on it. ALL orders will be sent out on Monday/Tuesday the latest. My mum is on an aeroplane, on her way to me as we speak. I really need help with turning the press. I can't risk it.... I'm not going to stop printing though. It's what I love to do. It keeps me sane. It makes me happy when I have nice customers. 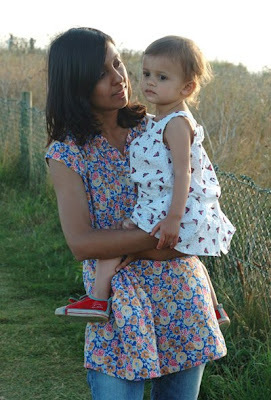 Here's a pic of my little one and I, last summer. Congratulations on the news! Take care. I've just gotten into printmaking myself, Your designs are such an inspiration, I just love them. Yay! You've made the annoucement! I hope the sickness will go away and you will feel better real soon! 6 weeks now? Have you booked it with a GP or obstetrician for the routine tests, etc? I am so excited for you! Congratulations! It's so normal to shed a few tears, especially when the hormones are going wild anyway. Glad to hear you'll keep designing and printing - your work is lovely. Take it easy! Congratulations on your good news! I wasn't too worried about waiting for my bag as you have said on your product details that deivery could take up to two weeks anyway. I think as printers we always worry about the quality as no two prints are alike, I think that your work does look very professional and I think other people agree judging by the number of orders you are receiving. Things do always seem to happen at once don't they - it all sounds really good though, although proabably a little exhausting for you. Take care and look after yourself. Nic, thanks! I LOVE your new kitchen btw!!! Congratulations on the news. Hope you'll get better soon. Luckily morning sickness will go for sure one day :) You had such a good start, I think! Just do it slowly. Best wishes for you!